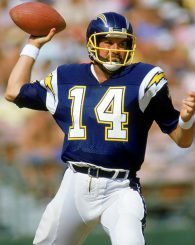 With all due respect to the great Norm Van Brocklin, Dan Fouts is the greatest NFL quarterback the University of Oregon has ever produced. 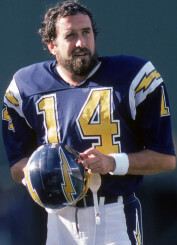 Dan Fouts is a member of the Pro Football Hall of Fame with the San Diego Chargers. With an impressive professional career spanning 15 seasons, Fouts garnered enough statistics, records and accolades to earn himself a membership in the Pro Football Hall of Fame in 1993. 43,000+ passing yards, 250+ touchdowns thrown, and six career Pro Bowl selections have unquestionably cemented Fouts as an all-time QB in the National Football League. The entire duration of Fouts’ time as a professional was spent in San Diego, where he led the Chargers to two AFC championship games. Despite this accomplished and historic career, over the span of the next two decades we will see another Oregon Duck eclipse Fouts’ legendary NFL tenure. Marcus Mariota will eventually surpass Fouts as the greatest NFL quarterback to ever don an Oregon Ducks uniform — you heard it here first! Now, I know what you are thinking. The superstitious fan might call this statement audacious, perhaps even a jinx. Mariota has not played a single snap in the NFL, and there is never a guarantee of future success in this sport. But, how many players have arrived in the league full of promise and potential, only to not pan out? The history of the NFL is littered with the shattered dreams of players who were chewed up and spit out by one of the most unforgiving sports there is. Marcus Mariota utilizes his foot speed in a game against Stanford at Autzen Stadium. Mariota will be different. An impeccable off-field presence combined with his physical abilities and high football IQ will keep Mariota healthy and playing for many seasons to come. Prior to being taken with the 64th selection in the 3rd round of the 1973 NFL draft, Fouts played three seasons with the Ducks. In that time, he compiled nearly 6,000 passing yards and a 37:54 touchdown/interception ratio (yes, you read that right). Admittedly, this was in an era of football when the running game took prominence. Fouts’ career passing statistics are difficult to compare to Mariota’s because of the difference in the workload these two men were asked to produce. The higher volume of passes that Mariota attempted gave him more opportunities to not only rack up positive statistics but also to throw more interceptions. 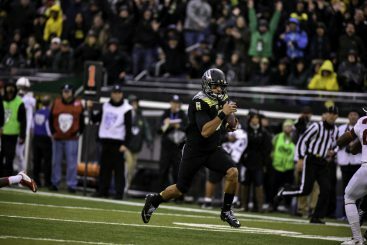 In comparison to the 956 passes that Fouts attempted while at Oregon, Mariota attempted 1,167 in his three seasons with the team. And although Mariota attempted 211 more passes, he posted a touchdown/interception ratio of 105:14, which is vastly superior to Fouts. Fouts threw nearly 1.5 interceptions for every touchdown, whereas Marcus Mariota threw 7.5 touchdowns for every interception. While many factors contribute to throwing touchdowns and interceptions, there can be little argument that Mariota was better at protecting the football in college than Fouts. So how does this translate to the NFL? All too often, college statistics show no correlation to player production at the next level. The speed and complexity of professional defenses affect players in different ways. Fouts played his entire NFL career with the Chargers. Fouts actually improved his accuracy and ball protection skills in the NFL, posting a career 58.8 completion percentage (compared to 50.4% at UO) and throwing more career touchdowns than interceptions with a ratio of 254:242. 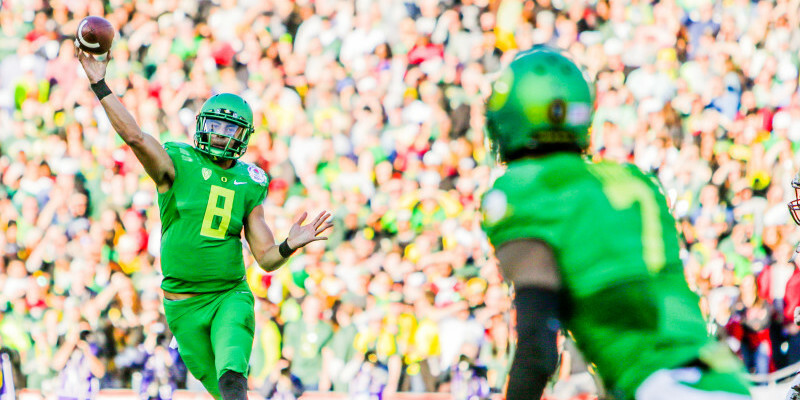 Can Mariota replicate Fouts’ marked improvement at the next level? Highly unlikely, if only for the fact that there isn’t much room to improve on the statistics Mariota produced in college. Mariota has several weapons in his arsenal that will translate to success in the NFL. As previously discussed, his decision-making ability when throwing the football is among the elite in college football history. He rarely makes costly mistakes, and has an uncanny ability for finding open receivers and avoiding risky throws. Also, Mariota can open up the passing game with his foot speed. If a defense is playing tight coverage, he can make them pay by taking chunks of yardage on the run. His decision-making also comes into play regarding his avoidance of taking big hits from the defense. This playing style will not only keep defenses honest in the passing game, but will also keep Mariota healthy as he chases down Fouts’ Hall of Fame legacy. 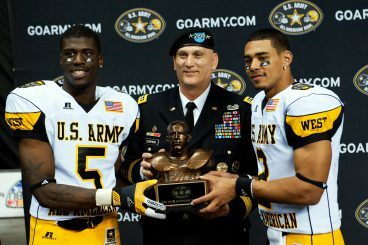 Dorial Green-Beckham received co-MVP honors for the U.S. Army All American Bowl in 2012. Fouts had great receiving options at his disposal, including Hall of Famers Charlie Joiner and Kellen Winslow. Mariota has unproven receivers in Tennessee, but there is a lot to look forward to in his partnership with another rookie in 6’5″, 237 pound Dorial Green-Beckham. If Mariota’s clean image off the field can influence Green-Beckham, this uber-talented wild card has the potential to become a top receiver in the next few seasons. Both Fouts and Mariota deserve high praise, however. Fouts accomplished a tremendous amount at both the University of Oregon and as a member of the San Diego Chargers. Mariota has solidified his place as a college football legend, and is poised to do the same as a Tennessee Titan. And while he has a long road ahead of him in chasing Fouts, he has a great opportunity and plenty of ability at his disposal.